After a couple of days of site-seeing and rest, the four Australians competing in the National Ninja League Finals were pumped and ready to go. With more than 170 ninjas from across America and the world competing, the competitors were split into three groups depending on their seeding. Australians Donny Byrne and Michael Perrella were running in sequence at the start of Group Two, while Josh McMurray was running second in Group Three as one of the top international qualifiers, second only to Ninja Warrior Sweden veteran Alexander Mars. The Stage One course was a notch up in difficulty from the qualifying course. Beginning with an ascending spiral of steps, ninjas then had to hold on through the bungee slider, transition to a second bungee and the lache onto a specific crash mad. Following this, competitors had a long rope swing before heading right onto a spinning log. If they survived this balance nightmare, it was straight onto another with a series of free-spinning pipes ascending in steps to another crash mat – one missed step and there was little chance of recovery. From there it was a mini-tramp jump to a pair of smooth nunchucks – aka the “Nopechucks” – and then a lache to a smooth cannonball known as “the Rejector” that competitors had to slide along to another platform before running up the tallest warped wall, which was roughly 14 feet tall. If just getting through wasn’t hard enough, the ninjas had a brutal time limit of 50 seconds to clear the stage – make one mistake and their ninja journey would come to an end. The Australians who fell in the International Qualifier were allowed to make an exhibition run in Group One, but their efforts didn’t inspire the official runners with much confidence as Luke Shelton, the first runner of the day, fell on the first obstacle and only Gav Wilson made it past the rope swing, coming off on the ascending pipe steps. Only three people cleared Stage One in Group One, including Swedish qualifier Anders Oscarsson, adding to the pressure being felt by the Australian cohort. First up in Group Two was Donny Byrne, the competitive tree climber and arborist. Having made it through the balance obstacles in the International Qualifier without much difficulty, Byrne would have no respite for his least-favourite obstacle type in this balance heavy speed-course. Byrne shot out of the gates, breezing through the steps, making short work of the bungees and nailing the rope swing on his first attempt – a crucial step in avoiding huge time pressure. Coming into the balance portion of the course, the father of two didn’t hesitate and was sure-footed as a mountain goat through the spinning log and spinning pipe steps. Having reached the mini-tramp in just over 30 seconds, the Irish-born ninja had plenty of time to finish the course, but his jump was slightly off and he missed his grab on one of the nopechucks, ending his run agonizingly close of the finish. With the one Australian knocked out, it was up to the youth movement of Michael Perrella and Josh McMurray to carry the flag for the land down under. Running third in Group Two, Perrella was nervous about the balance obstacles, but confident that he would have no difficulty with any of the other obstacles on the course. This confidence proved warranted on the first two obstacles, but the electrician had near misses on the rope swing and the spinning log. Taking the slow and steady approach on the spinning pipe steps, he was able to clear the balance obstacles without much difficulty and the finish line seemed certain. However, his jump on the mini-tramp was off and, reaching the nopechucks at full extension, was unable to get purchase and fell off, making it a hat-trick of failures on the nopechucks for the Australians of Group Two. Despite neither Byrne nor Perrella finishing Stage One, they had proven they belonged by beating the efforts of all the exhibition runners and placed quite highly in the overall standings at the end of the event, finishing 39th and 44th, respectively. After the rest of Group Two finished, it was Josh McMurray’s turn to run, following Dutchman Perry Oosterlee’s shock failure on the spinning log moments earlier. If McMurray was feeling any pressure from being the last Australian standing, he didn’t show it, looking calm and focused in his signature board shorts and a Ninja Academy t-shirt. His seeming confidence was warranted, with the 24-year-old breezing through the course and, having worked at a trampoline park, had no difficulty nailing jump up to the nopechucks, easily transitioning to the rejector and making short work of warped wall to become the 12th finisher of the day to that point, and one of only three internationals that would make it through Stage One. When the dust had cleared on Stage One, only 27 people survived to take on Stage Two the next day, with Josh McMurray sitting in 9th place overall with his incredibly fast time. The course for Stage Two had another brutal time limit of 75 seconds, not to mention the even more difficult obstacles! Beginning with a short sprint to a huge rope swing to grab another rope, competitors would then need to transition to a salmon ladder, make two downward drops on the rungs, transition across to the top of a second salmon ladder and then swing across three more ropes before reaching the ground again. From there, a series of hanging silks needed to be traversed before dismounting onto a mini-tramp and onto a reverse slider, where the ninjas needed to jump a heavy metal ring up a step on the slider twice before dismounting onto a cat-grab on the edge of a platform. After running across a series of wooden boxes, the athletes would then need to push a heavy wooden box along a track and over a white line. Rocking a pair of grey jeans, a Ninja Academy shirt and his new STR/KE MVMNT kicks, McMurray showed little concern about the course ahead of him. Taking off with lightning speed and getting a nice high swing on the rope, the carpenter decided not to waste time turning around on the salmon ladder drops, instead choosing to face forwards in anticipation of the transition across. Making it through the salmon ladder and ropes with ease, McMurray wasted no time getting onto the silks, staying high to reduce the stretchiness of the fabric. Rather than jump onto the tramp and straight up to the metal ring, the climber simply stuck the landing and made a standing jump up to the ring. Sliding down to the first jump, McMurray took a moment to figure out the technique and made the two jumps on his first attempts. With just the box jumps and push ahead of him, the former competition skateboarder cruised through final few obstacles to progress on to Stage Three. 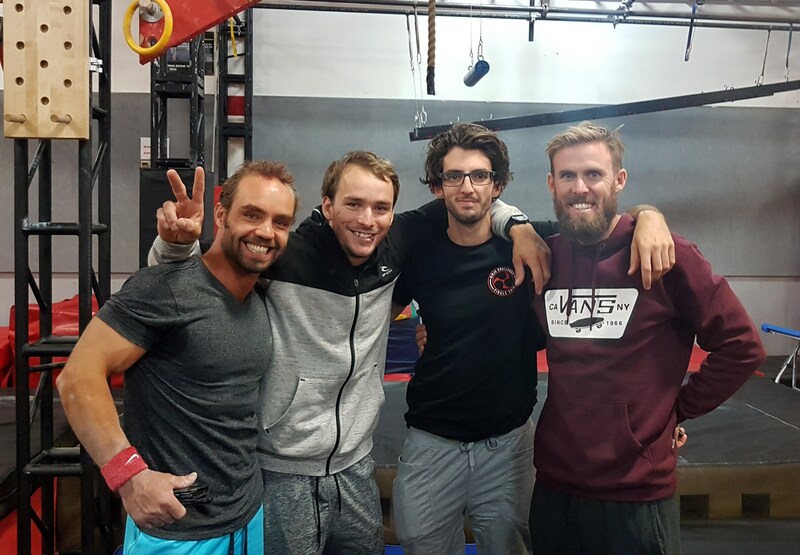 After a short break while Stage Three was set up and tested, McMurray and fourteen other incredible athletes returned to Apex Movement NorCal to take on the final course. This course was significantly different from the first two, with chalk provided and no time limit – although competitors were only allowed to rest for 30 seconds between obstacles. Stage Three began with a series of ascending and descending salmon ladder transitions, with the added condition that every jump had to land in the correct rungs or the competitors would be eliminated. From there, the ninjas would climb up a rope without using feet and transition to the pipe slider, a pipe that must be moved across a pair of perpendicular pipes to reach a pair of stoppers before a lache to a foam box. The tricky part of this obstacle was getting enough swing for the dismount without sliding back on the bar. From there, the athletes had to swing in an arc on a trapeze bar and jump to a cliffhanger ledge. If they stuck this landing they would transition to another ledge and then have to make a reverse lache to another cliffhanger. Anyone who made it this far would then have to make three rotations on the pipe wheel before taking on the dreaded vertical limit obstacle. Unlike American Ninja Warrior and Sasuke, competitors didn’t have to finish the course to earn prize money – the last man standing would be declared the winner of the NNL 2017 season. Running eighth of 15, McMurray was able to witness a number of strong competitors struggle with the dismount on the pipe slider. Right before McMurray was set to run, American Ninja Warrior fan favourite Jake Murray had gotten both feet on the platform, but his momentum had carried him backwards off the box. Imploring the crowd to cheer for him on the starting line, the 24-year-old looked like he was having the time of his life as he prepared for the brutal final stage. Executing the ascent flawlessly, McMurray’s run almost came to a premature end on the descent as one side of the bar almost went into the wrong set of rungs. Having escaped that brush with disaster, the experienced competitor took his full 30 seconds of rest before ascending the rope and transitioning to the pipe slider. Looking smooth as he slid across the rails to reach the stoppers, he immediately lost control of the bar as he attempted to generate swing for a dismount, with one side sliding backwards. Slowly bringing the bar back, he opted for a straight-armed hang, he took one small backswing and then kicked his body forward, but as he released the bar moved backwards slightly, robbing him of momentum. Hanging in the air for a moment, the last Australian landed with both feet on the edge pad, but as the foam collapsed underneath him, his momentum carried him backwards and his run was over in almost identical fashion to Jake Murray before him. Only four competitors were able to stick the dismount, including Swedish ninja Alexander Mars, who couldn’t transition to the cliffhanger. Running last, the prohibitive favourite going into the event, Drew Dreschel, busted out a crazy technique on the pipe slider and stuck the landing easily, also being the first to transition to the cliffhanger successfully, but couldn’t make the reverse jump. With the competition over, McMurray finished 13th overall and joined Alexander Mars as the only international to compete in all three stages. Congratulations to Josh, Donny and Michael for their incredible efforts representing Australia – hopefully there will be an even bigger group representing us next season and the Ninja Academy team can enjoy even greater success. UPDATE: At his request, references to the fourth Australian were removed from this article.